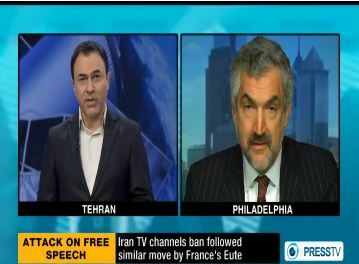 I appeared on "Press TV," the Iranian-government's English-language television channel on a show someone with a sense of humor called "News Analysis." The 25-minute show was the most hare-brained and loony of my 35 years going on television. The ostensible topic was the just-signed US$633-billion "National Defense Authorization Act" and specifically its section 1248, "Impositions of Sanctions with Respect to the Islamic Republic of Iran Broadcasting" i.e., sanctions on Press TV itself. In fact, thanks to the selection as fellow panelists of two left-wing conspiracy theorists, Kevin Barrett and Joe Iosbaker, the show barely touched on anything so mundane as NDAA section 1248. Instead, the audience was treated to such tidbits as 9/11 having been a "pro-Israel coup d'état" and the U.S. government running torture chambers all over the world. Indeed, viewers would have heard me accused of being a torturer.